Indiana Gov. 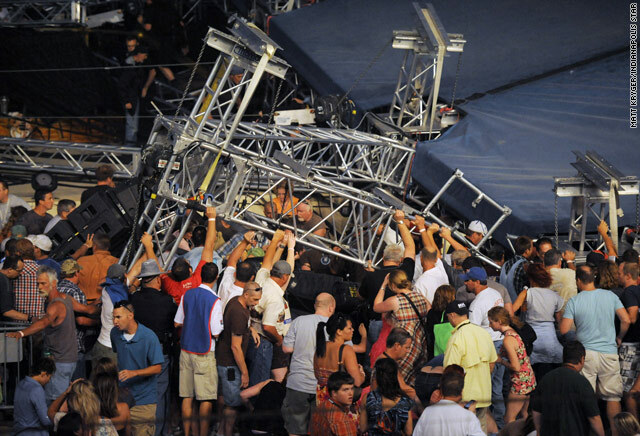 Mitch Daniels calls the collapse a "freakish accident"
(CNN) -- Crews on Sunday sifted through debris of a concert stage that collapsed at the Indiana State Fair, trying to determine what caused the accident that killed five people and injured 40, authorities said. The fairgrounds were closed Sunday as investigators began the search for answers. The state fair was expected to reopen to the public Monday following a public memorial service to remember those who were killed and injured, said Cindy Hoyne, the fair's executive director. Forecasters warned heavy rain and strong winds would hit the fair nearly two hours before the storm moved through, causing the collapse of the stage Saturday night. The National Weather Service estimated winds at 60 to 70 mph. Metal scaffolding fell onto the "Sugarpit," a section usually occupied by Sugarland's most ardent fans, about four minutes after authorities took the stage to warn the crowd to seek shelter, according to a timeline of events released by investigators Sunday. "It's not clear to me at this stage how anyone could have foreseen a sudden, highly localized gust of wind in one place," Gov. Mitch Daniels said. Video shows the blue canvas top fraying and flapping just seconds before the steel scaffolding gave way, sending a heavy bank of stage lights and metal onto fans closest to the outdoor stage. Gov. Daniels described the collapse as a "freakish accident." Sugarland, an Atlanta-based country duo, escaped injury since they had not yet come onstage. They later posted a message on Twitter saying they were "stunned and heartbroken for the fans." The group -- along with its opening act, Sara Bareilles -- cancelled their scheduled performance Sunday night at the Iowa State Fair. According to the fair's website, "aside from coping with the magnitude of the accident, the ongoing investigation prevents the band from getting what may remain of their stage equipment." Jennifer Nettles, one half of the Sugarland duo, posted a statement on the group's web site Sunday, saying "there are no words to process a moment of this magnitude and gravity." "There are only prayers for peace in the hearts of the bereft, and prayers of thanksgiving for those who were spared or safe. A piece of our heart is left in that grandstand," Nettles said. Sara Bareilles, who had just finished her performance when the collapse occurred, tweeted Sunday she was still thinking of all those affected." On her web site, she wrote: "The accident at the Indiana State Fair felt like a bad dream. The weather changed in a matter of minutes and the stage collapsed in a matter of seconds. " She called the emergency response "incredibly quick." While most of the injured were treated and released from Indiana University Health Methodist Hospital, nine patients were admitted and still being treated Sunday afternoon, the hospital said. Three children remained at Riley Hospital for Children, the hospital said. The Marion County, Indiana, coroner identified the three women and two men who died as: Tammy Vandam, 42, of Wanatah, Indiana; Glenn Goodrich, 49, of Indianapolis; Alina Bigjohny, 23, of Fort Wayne, Indiana; Christina Santiago, 29, of Chicago; and Nathan Byrd, 51, of Indianapolis. Vandam, Goodrich, Bigjohny and Santiago were dead at the scene, while Byrd died later at the hospital, the coroner said. Friends, colleagues and family gathered Sunday to remember Santiago at Chicago's Howard Brown Health Center, a health care organization for lesbian, gay, bisexual and transgender people, where she worked. "We have lost a fierce warrior, an amazing activist," said Rosa Yadira Ortiz, board president for Amigas Latinos, a group for lesbian Hispanics in Chicago that Santiago was involved in. "She really brought us all together." The families of two of those hospitalized released brief statements Sunday, each asking for prayers and privacy. "Jenny Haskell, a 22-year-old Ball State senior, is very critical at this time," her family said. A fifth-grader, identified only as Jade, is in critical condition, according to her family. "A big gust of wind came through. You could see a lot of people panicking," said Aaron Richman, who witnessed the collapse at the fair in Indianapolis. "All the scaffolding and speakers -- all that came crashing down -- and the whole stand just collapsed." Allison Hoehn, another concertgoer, said many attendees rushed to those trapped after the stage crumbled. "We tried to get down to help, but no one was moving," Hoehn said. "The storm came on so fast and the stage just snapped like a toothpick." Spectators grabbed parts of their seats to assemble makeshift stretchers, Hoehn said. "Everyone rushed to help, and we saw people searching and pulling people out," she said. "(I) saw five people go away on stretchers. It was amazing how many people ran in to try to lift the scaffolding." Capt. Brad Weaver, commander of special operations for the Indiana State Police, said he took the stage at 8:45 p.m. to warn the audience of severe weather. Weaver said he "saw the framework from the stage start to come over." He said he and others took cover behind a trailer, which was also struck by debris from the stage. Weaver said authorities were in the process of issuing an evacuation order, but Hoehn said no one told the crowd at the concert to evacuate. Earlier this month, severe weather caused a stage to collapse before a Flaming Lips performance in Oklahoma. The August 6 incident occurred after heavy winds and rain pounded Tulsa, ending a block party music festival that featured Primus, the Flaming Lips and other acts. A lighting rig fell down and struck audio equipment and instruments. It was unclear whether there were any injuries. And last month, a severe storm toppled a stage when classic rock band Cheap Trick was performing. No one was seriously hurt during the incident at the Cisco Ottawa Bluesfest in Canada. CNN's Alan Duke, Chelsea J. Carter, Leslie Tripp and David Williams contributed to this report.